The plasma welding process was introduced to the welding industry in 1964 as a method of bringing better control to the arc welding process in lower current ranges. Today, plasma retains the original advantages it brought to the industry by providing an advanced level of control and accuracy to produce high quality welds in both miniature and precision applications and to provide long electrode life for high production requirements at all levels of amperage. Plasma welding is equally suited to manual and automatic applications. It is used in a variety of joining operations ranging from welding of miniature components to seam welding, to high volume production welding, and many others. Pictured above is a plasma arc on the left and a TIG arc on the right. Below, the diagram shows the schematic difference between the plasma arc on the left and the TIG arc on the right. Note the cylindrical shape of the plasma arc when compared to the conical shape of the TIG arc. A plasma is a gas which is heated to an extremely high temperature and ionized so that it becomes electrically conductive. Similar to GTAW (TIG), the plasma arc welding process uses this plasma to transfer an electric arc to a workpiece. The metal to be welded is melted by the intense heat of the arc and fuses together. 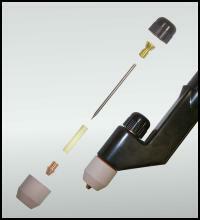 In the plasma welding torch a Tungsten electrode is located within a copper nozzle having a small opening at the tip. A pilot arc is initiated between the torch electrode and nozzle tip. This arc is then transferred to the metal to be welded. By forcing the plasma gas and arc through a constricted orifice, the torch delivers a high concentration of heat to a small area. With high performance welding equipment, the plasma process produces exceptionally high quality welds. Plasma gases are normally argon. The torch also uses a secondary gas which can be argon, argon/hydrogen, or helium, which assists in shielding the molten weld puddle thus minimizing oxidation of the weld. In order to perform plasma arc welding, the following is required: a power supply; a plasma console (sometimes external, sometimes built in); a water recirculator (sometimes external, sometimes built in); a plasma welding torch; and a torch accessory kit (tips, ceramics, collets, electrodes, and setup gages). There are a range of features and benefits to plasma arc welding. Plasma arc welding features a protected electrode which allows for less electrode contamination. This is especially advantageous in welding materials that out gas when welded and contaminate the unprotected GTAW electrode. Plasma arc welding has forgiveness in arc length changes due to arc shape and even heat distribution. This results in the arc stand off distances not being as critical as in GTAW. Plasma arc welding gives a good weld consistency and no AVC is needed in 99% of applications, sometimes even with wirefeed. The arc transfer is gentle and consistent so it provides for welding of thin sheet, fine wire, and miniature components where the harsh GTAW arc start would damage the part to be welded. Offering a stable arc in welding reduces arc wander so the arc welds where it is aimed allowing weld tooling in close proximity to the weld joint for optimum heat sinking. A plasma welding torch has an intricate internal design to carry plasma pilot gas, shield gas, water cooling hoses, and power cables for plasma pilot arc current and weld current. There is only minimal high frequency noise used in plasma arc welding to start the pilot arc, thus plasma can be more easily used with NC controls with less fear of the arc starting noise causing glitches in any electrical equipment. Another benefit lies in welding applications involving hermetic sealing of electronic components where the GTAW arc start would cause electrical disturbances possible damaging the electronic internals of the component to be welded. Arc energy in plasma welding can reach three times that of TIG welding causing less weld distortion and smaller welds with higher welding speeds. Welding time can be as short as 0.005 sec, ideal for spot welding of fine wires, while the accurate weld times, combined with precision motion devices, provide for repeatable weld start/stop positions in seam welding. Low amperage arc welding (as low as 0.05A) allows welding of miniature components and good control in downsloping to a weld edge. The arc diameter chosen via the nozzle orifice used assists in predicting the weld bead size. The plasma process can gently yet consistently start an arc to the tip of wires or other small components and make repeatable welds with very short weld time periods. This is advantageous when welding components such as needles, wires, light bulb filaments, thermocouples, probes, and some surgical instruments. When dealing with hermetically sealed medical and electronic components, sealed via welding, the plasma process provides the ability to--1) reduce the heat input to the part; 2) weld near delicate insulating seals; and, 3) start the arc without high frequency electrical noise which could be damaging to the electrical internals. A whole repair industry has sprung up to assist companies wishing to reuse components with slight nicks and dents from misuse or wear. The ability of modern microarc power supplies to gently start a low amperage arc and make repairs has provided users with a unique alternative to conventional repair and heat treatment. Both the micro-TIG and microplasma welding processes are used for tool, die, and mold repair. For outside edges the plasma process offers great arc stability and requires less skill to control the weld puddle. To reach inside corners and crevices the TIG process allows the tungsten welding electrode to be extended in order to improve access. In strip metal welding, the plasma process provides the ability to consistently transfer the arc to the workpiece and weld up to the edges of the weld joint. In automatic applications no arc distance control is necessary for long welds and the process requires less maintenance to the torch components.